The bountiful durian season in Thailand wound down to its tail end as I left to return home to Oakland at the end of this June. But I had my fill the last three weeks of my stay, succumbing to temptation time and again as I walked down Bangkok’s busy streets, around bustling open-air marketplaces and even through the produce aisles of modern supermarkets. 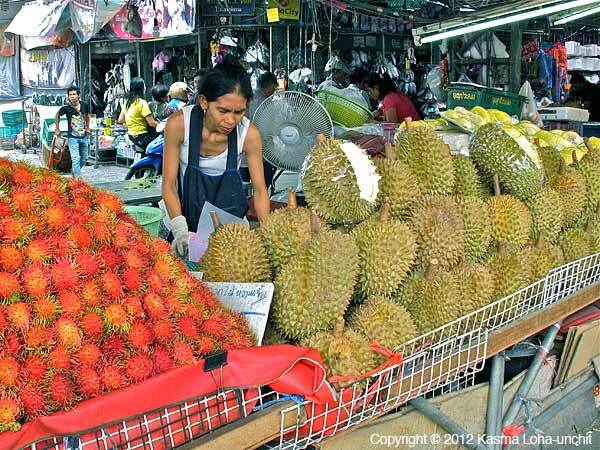 The “King of Fruits” was everywhere and it’s so easy nowadays to satisfy a craving without having to overeat, overspend, or be intimidated at having to pry open the wickedly spiky fruit oneself. 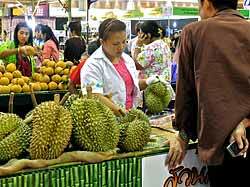 Unlike days long passed, it’s no longer necessary to buy durians whole. From streetside vendors to supermarket aisles, the fruit is available already peeled and sealed in packages holding one to two sections of the fruit (a durian has three to five sections, depending on size and shape), costing anywhere from 60 to 150 baht ($2 to $5) when the fruit is in season and usually doubling in price during the off-season. The packages are wrapped in clear plastic, making it easier to tell how ripe the fruit is and select according to one’s taste. 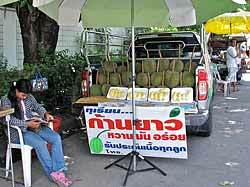 Some Thais like their durian under-ripe (hahm hahm) with more of a crisp texture and less of a scent. Some like it really ripe (ngom ngom) – soft and creamy with a robust aroma and usually a deeper color. Many prefer it “just right” – neither too green nor too ripe (gkam lang gkin or “just the time to eat”), which is what I usually go for. At this stage, it is rich and creamy like custard, yet firm in texture without being too soft or too moist, and deliciously fragrant without being too sulfurishly odiferous. Most vendors won’t allow you to touch the package to feel how firm or soft the fruit is, so visual guidance has to be depended upon. But they will tell you the stage of ripeness of the package that looks good to you. Some label the stage of ripeness, in Thai of course, on the plastic wrap next to the price. During my childhood and youth, in the days before styrofoam, plastic wrap and air-conditioned supermarkets, durians were sold only whole and buying one involved quite a ritual. 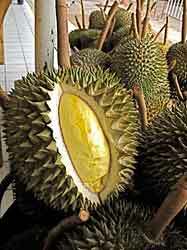 Some people could tell a good durian by just looking at it, while others relied on their sense of smell. The size and shape of the fruit were important considerations. A round and perfectly symmetrical one was likely to have more sections holding more fruit than an unevenly skewed one. Vendors often used a bamboo stick to tap on the spiky fruit to determine ripeness by tone. They would cut a triangular-shaped plug through the thick brownish green peel for the prospective buyer to take a peak at the fruit inside, smell more closely and even lightly touch the flesh. 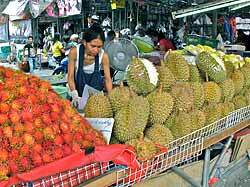 When all the indicators met with the customer’s satisfaction, the durian was weighed and haggling over price would take place. After the purchase, another set of rituals took place. 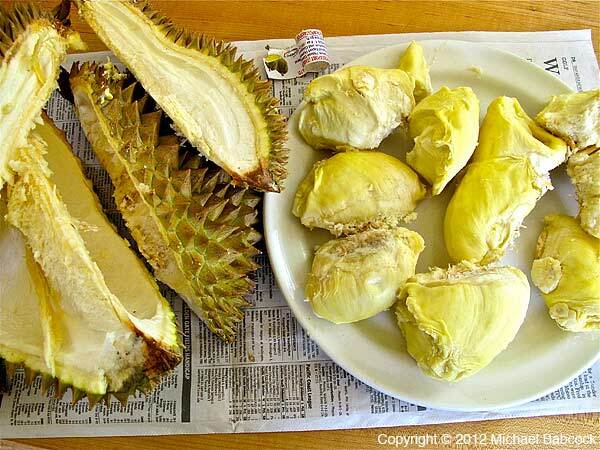 if a household had both durian lovers and durian haters like my family, when the fruit was brought home, it would have to be kept and pried open outside the house – in the garden or the detached kitchen behind the house. 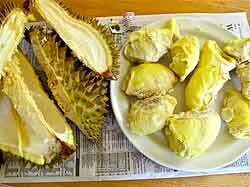 Then it would have to be consumed by the durian lovers in its entirety before they could return into the house. There were no air-tight plastic containers in those days to store uneaten portions in the fridge, and even if they were carefully wrapped for storage in the fridge, the durian’s tenacious aroma could easily escape through any seal and permeate the ice box, contaminating everything within. 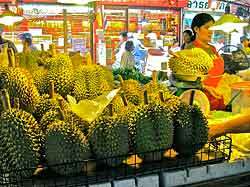 For durian haters, even imperceptible levels of the fruit’s scent was objectionable and the cause of much family discord. 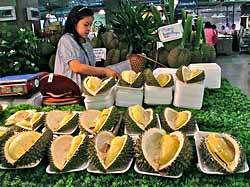 Of course, most durians are still sold whole today to satisfy the craving of several people in a family (it’s less expensive to buy whole fruits) and the ritual of selecting one still takes place as described. A difference from the past is that after a durian is bought, the vendor provides the additional service, it it is desired by the customer, of peeling and boxing the golden yellow chunks of the inner fruit in styrofoam or wrapping with clear plastic. One no longer needs to risk being jabbed by the nasty spikes just to enjoy the fruit. Back in the Bay Area, satisfying a durian craving can be an expensive affair as fresh durians are sold only whole – for as much as $7 a pound! That’s exponentially higher than the approximately 100 baht (around $3) I have been spending the past few weeks on an already peeled package of absolutely divine tree-ripened fruit. There are, of course, less expensive frozen durians – whole as well as peeled in sealed packages, but any kind of frozen fruit loses a lot of its true character and durian is not the least of them. 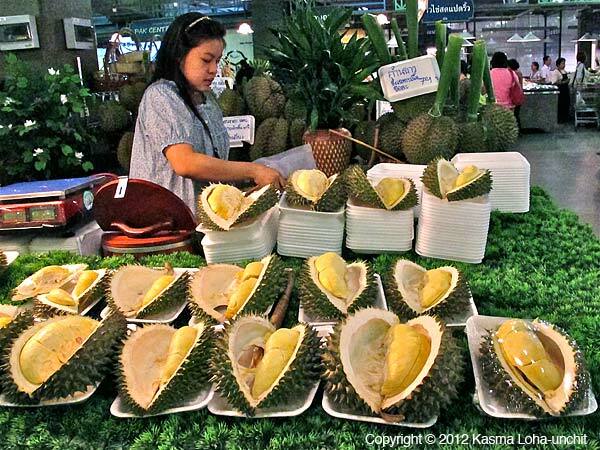 For durian lovers, a fresh durian is worth the price to satisfy a seasonal addiction. But of course, durians imported into the Bay Area, almost all of them from Thailand, tend to be picked quite green when there is little, if any, aroma detectable to foul up closed spaces during transport. This makes for quality that is less than ideal. For me, I take a closer look than if I were buying one in Thailand. The stem and exterior should look fresh and not dried out and there must be a distinctive durian fragrance coming through when I hold the bottom of the fruit up to my nose. Better yet, if there is a small split on the bottom of the durian, I am assured that the fruit has been picked closer to maturity and has continued to ripen in transit. But of course, if there is no smell at all exuding from the split, there’s the chance that the split might have come about from the fruit banging against other fruits during transport. If there is a faint fragrance, I would consider buying it and leaving the fruit at room temperature in the basement or garage for a day or two until the aroma becomes more prominent before prying it open. The split makes it easier for you to open up the durian. Twice this spring I came across durians at a small market in Oakland Chinatown that had all indicators that they were worth buying. And both Michael and I weren’t disappointed! There was enough in each fruit to satisfy us for a couple of sittings. 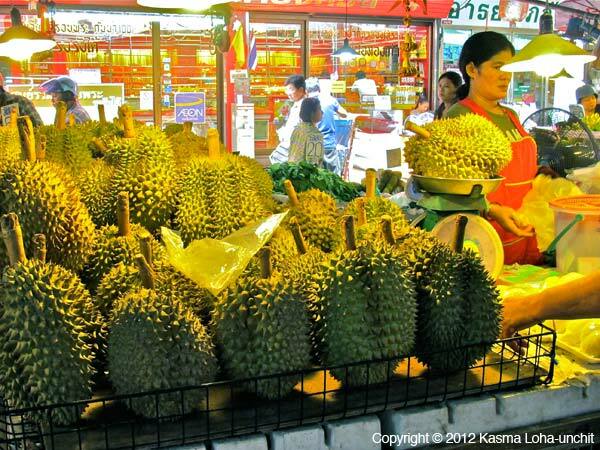 At $6.59 a pound for an average five-pound durian, we ended up with only about a pound and a half of peeled edible fruit. An expensive splurge that’s for sure! 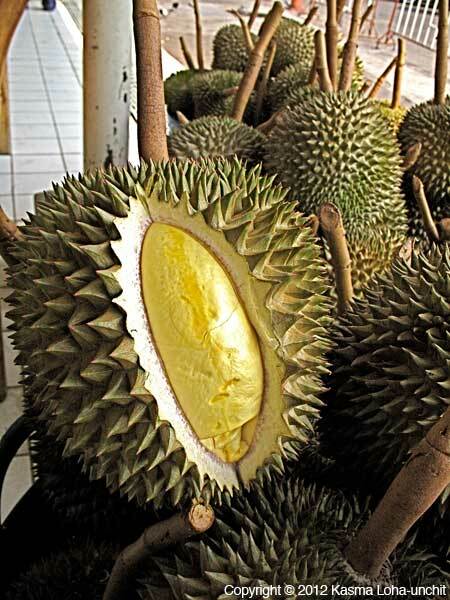 For Michael, that would have to do for this durian season. For me, they were just teasers, as I knew I would certainly be indulging in more during my planned three-week trip to Thailand in June to visit my mother. And indeed I took every opportunity to satisfy my craving! 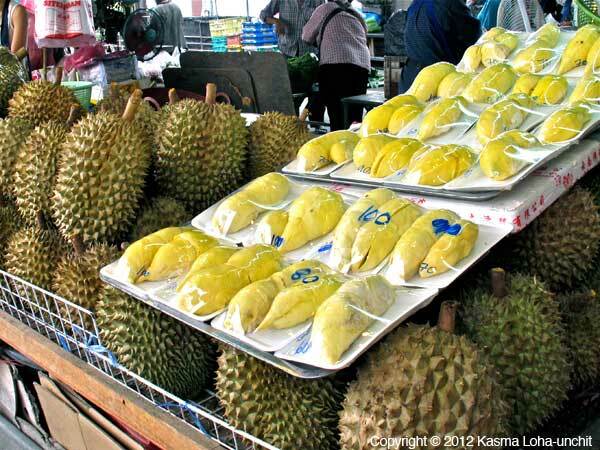 Kasma’s article Durian – King of Fruits. 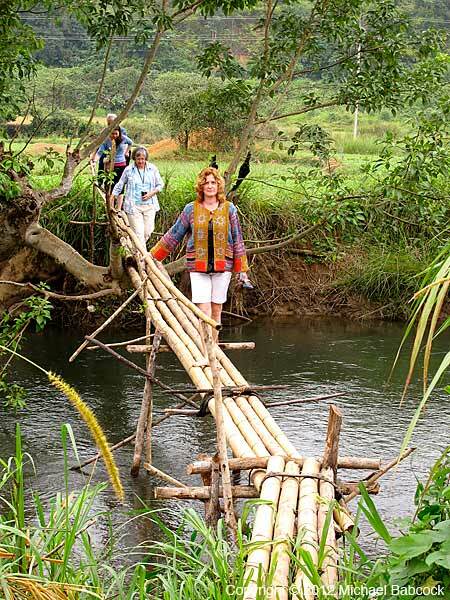 Mae Hong Son Resort: Kasma’s trips to the north (including her 28-day Trip A and 19-day Trip B) spend several days in Mae Hong Son, both in the city and around the province. It’s a somewhat isolated city, up in the northwest corner of Thailand near Burma, and the Burmese influence is obvious (particularly in many of the temples). 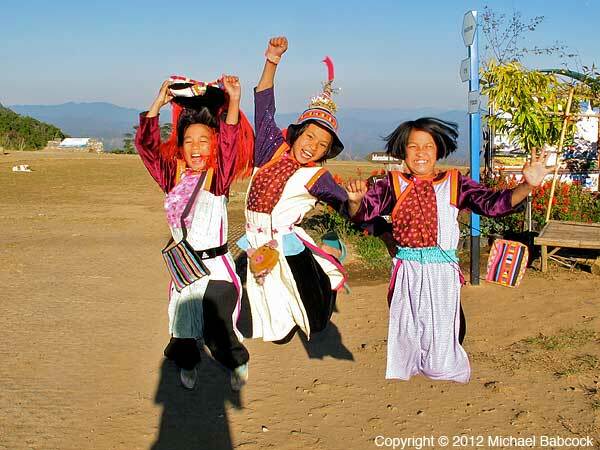 Mae Hong Son is notable, in part, for its large hill tribe population, mainly Lisu and Karen (pronounced “Gu-rian”). I love the resort where we stay. 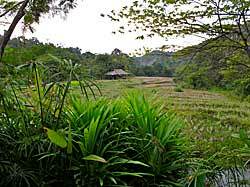 It’s nestled in amongst rice fields and is a peaceful, lovely place to spend 4 nights. 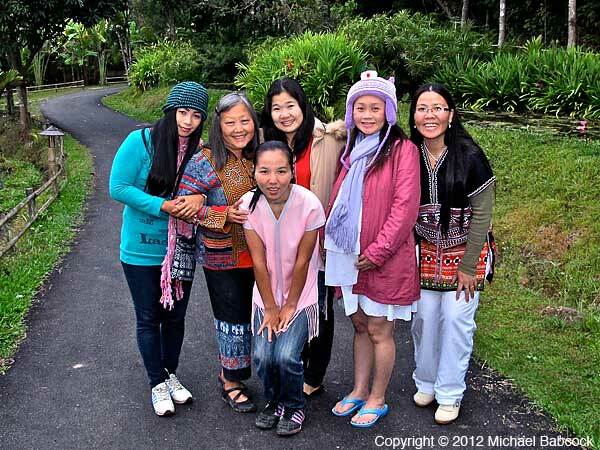 Most of the staff there are Karen hill tribe women and their friendliness is much of the fun of staying here; we get to benefit from the many years Kasma has been on her tours and formed lasting relationships with people all over Thailand. We use this lovely resort for our command center as we spend the days exploring Mae Hong Son. Many of the rooms have lovely views of the rice fields, such as the one above from our room last year. There’s a lovely area called the “Rice Terrace” where you can order a drink and sit and watch lovely sunsets, such as this one above. Rice Field Walk, Mae Hong Son Province: On Kasma’s trips we’re often lucky enough to end up on excursions not planned in the itinerary. While staying in Mae Hong Son, we always take one day to go up the (extremely) windy roads to the little town of Ban Rak Thai (see below). This past year some activity in the fields directly off the road caught our eye. Kasma stopped the vans and off we went on a ‘rice field’ walk – though at that time of the year I believe it was soy beans. 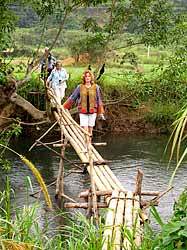 It was great fun, wandering through the fields on raised mounds in-between the crops, crossing over a rickety bridge, really just a few sticks of bamboo, over a stream, and meeting farmers and a woman resting in her home, right amongst the fields. To the left we see the bridge we needed to cross on our impromptu excursion. 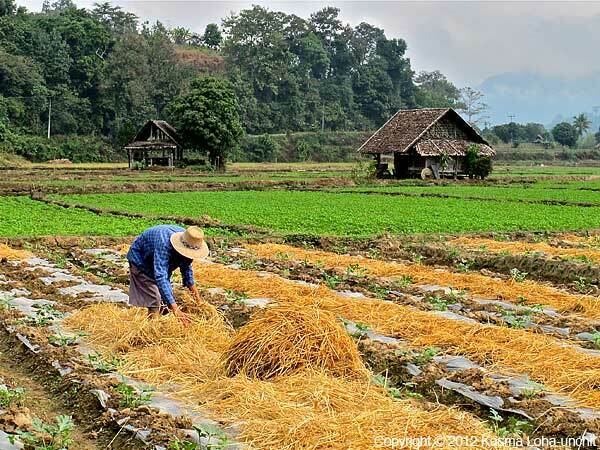 The farmer on the right is spreading straw in-between the rows of crops. 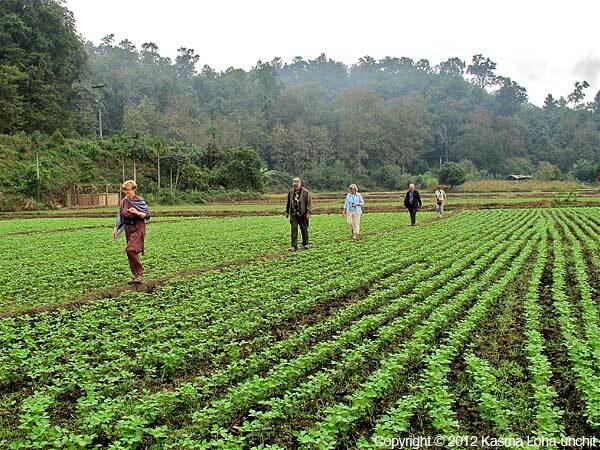 Ban Rak Thai – บ้านรักไทย: Ban Rak Thai literally means “Village Love Thailand.” It’s a little village nestled up at the top of Mae Hong Son Province about a kilometer from the Myanmar border. (Show in Google Maps.) 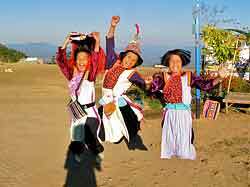 The village was founded by ex-Kuomintang soldiers from Yunnan province who had to leave China when the Communists took over. 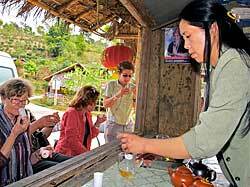 The Thai government allowed them to settle here where they began growing tea and eventually became Thai citizens: the name “Love Thailand Village” reflects their gratefulness to Thailand for taking them in. One nice thing about the village is that it will never be heavily-touristed: the road is too steep and winding for the big tour buses. Even in our mini-vans, we stop at one point on the way back down to allow the brakes to cool off. After reaching the town, we go to Gee Lee, the original and best of the tea-houses and restaurants. We start out by sampling (and buying) several kinds of tea: Oolong teas, green teas and a ginseng-infused tea. 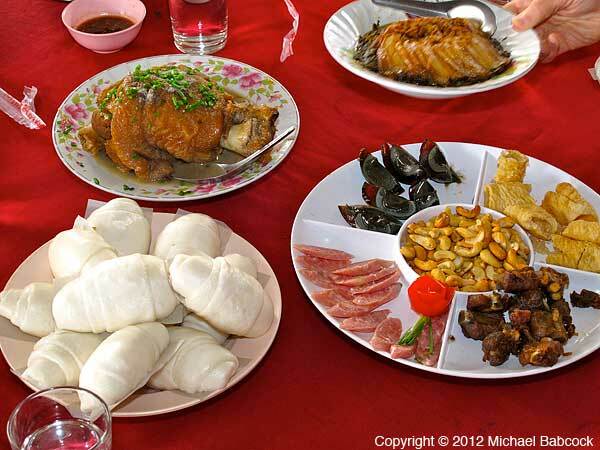 We then have a Yunnan-style feast; and I do mean feast! 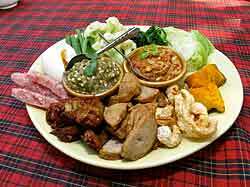 There are delicious pork dishes, including skin-on, stewed pork leg (succulent and rich) and a tasty pork-belly dish. 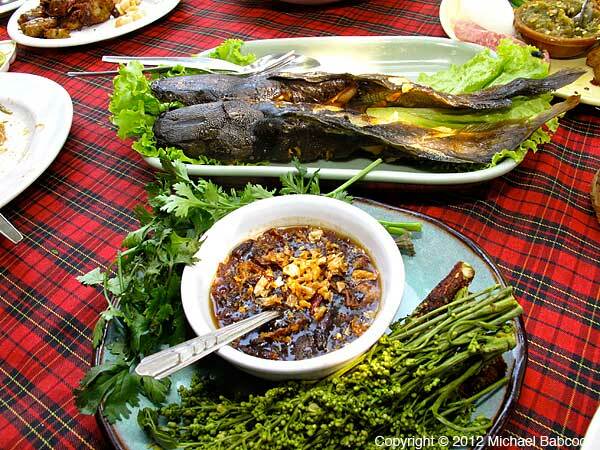 There’s a whole, fried fish, soup and a fresh tea leaf salad. 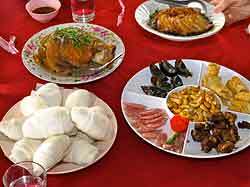 The dishes in the picture are (clockwise from left), buns (to be eaten with pork leg), stewed pork leg, pork belly and an appetizer platter with sour pork sausage, thousand-year old eggs, egg rolls, pork ribs and cashews. After eight delicious dishes, we were well-gruntled indeed! 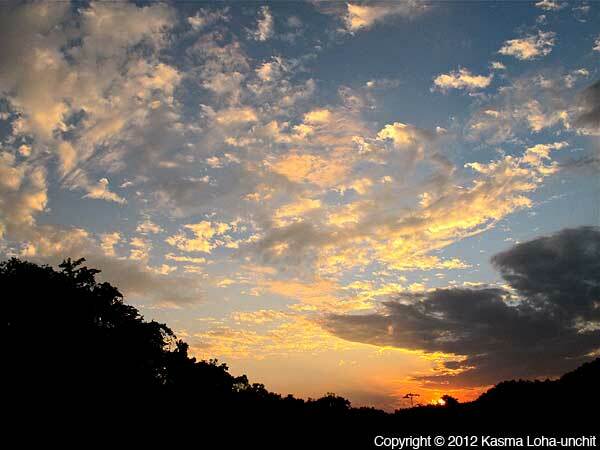 Drive from Mae Hong Son to Pai: Another strength of Kasma’s trips is that we drive pretty much everywhere. Not only do you get to see some beautiful scenery, you get a better sense of the country. Mae Hong Son province, in particular, is quite lovely and people who fly into Mae Hong Son city miss the scenic beauty. On one of the routes from Chiang Mai (via Mae Sariang) there are 1864 curves: a fact trumpeted on t-shirts you can buy in the markets. 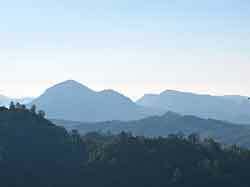 On our return from Mae Hong Son we travel via Pai and see some of the prettiest scenery in Thailand. We stop at a vista point where we saw the lovely view to our left. Along the way we stop at another place selling green tea and, if we’re lucky, also find delicious, fresh-grilled sour-sausage at the same stop. 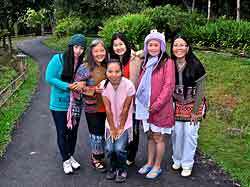 At one stop with fabulous views, we came across these Lisu girls, dressed in traditional garb, available to be photographed, for a fee. On this last trip, they approached Kasma and asked for a few baht and she told them: “I’ve already been to a village where I’ve taken plenty of pictures.” When they didn’t believe her, she showed them the images on the back of her digital camera. She asked if they’d like to have her bring them their photographs next year. The next thing we knew, they were enthusiastically throwing themselves in the air for us to photograph. And they will get their pictures this coming year when we pass that way again. 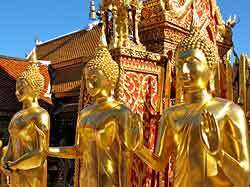 Wat Doi Suthep in Chiang Mai: Thailand is a Buddhist country and we visit many temples on our trip. One of my favorites is Wat Doi Suthep in Chiang Mai. It is said that if you don’t visit Doi Suthep, you haven’t really been to Chiang Mai. We spend a morning at the temple, seeing all the Buddha statues, the bustling activity and the Thai people offering incense and walking clockwise around the main chedi (the Thai word for stupa). To the left we see some of the Buddha statues that circle the main chedi. The vendor to the right is actually found at the very base of the temple before you enter the compound. 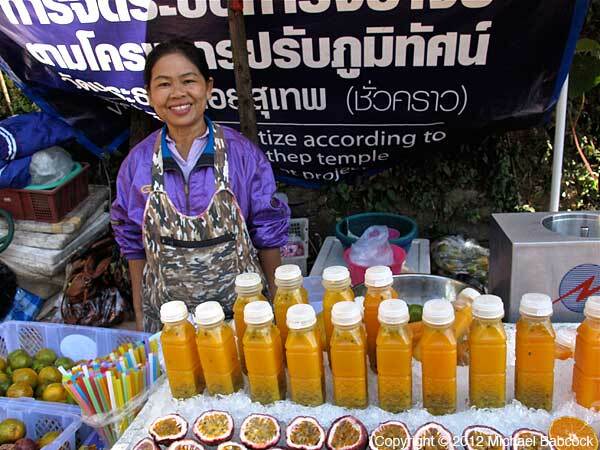 She’s selling unsweetened passion fruit juice with the seed included. It’s a sour drink, quite refreshing. Kaeng Ron Baan Suan Restaurant in Chiang Mai: It’s not really possible to have a list of favorite moments from Kasma’s trip without including one of the many Thai feasts we enjoy. There are so many memorable ones; which one to choose? My favorite Restaurant in Chiang Mai is Kaeng Ron Baan Suan Restaurant – ร้านอาหารแกงร้อนบ้านสวน – literally “Hot Curry Garden.” It’s in a lovely garden setting; we usually go for lunch when it’s a bit less crowded. It has a number of northern specialties that we don’t find anywhere else. The picture to the left shows a platter with various vegetables, sausages and fried pork skin with two dipping sauces. The green one to the left is Naam Prik Num – Northern Thai Roasted Young Green Chilli Dip; it is made with roasted green chillies and is very, very hot indeed. The reddish one to the right is Naam Prik Ong, a pork-based sauce. 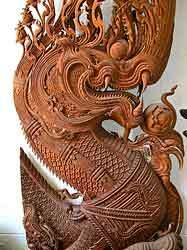 Lanna Wood Carving Museum in Chiang Mai: I’ll conclude with a bonus picture from a wood carving museum – Ban Roi An Phan Yang Museum – located at Chiang Mai-Sanpatong Road between kilometers 19 and 20. This museum is the labor of love of a Thai man, Charoui Na Soonton, who has collected numerous wood carvings to be displayed in his Lanna-style house. Walking through the museum, you walk through a warren of rooms filled with intricate carvings that leave you gasping in amazement. There are many bas-relief carvings from the Ramakien (the Thai version of the Ramayana), Buddha statues, elephants, goddesses, demons and more. It’s another one of those sites where Kasma goes that would be difficult to discover on your own; luckily, she’s found them all for us. 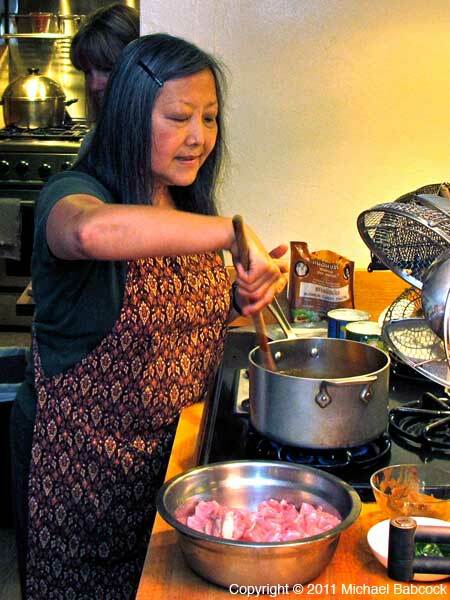 My wife, Kasma Loha-unchit, has been teaching Thai cooking to U.S. students since 1985. This blog talks about her first beginning class in an evening series of four classes. 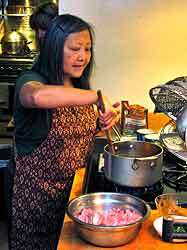 Kasma prefers to teach a series of classes because it’s impossible to give an adequate introduction to Thai food in just one class. Living with Kasma, I tend to take great Thai food for granted. When I met Kasma, she had been teaching classes for 6 years so they’ve always been part of our life together. I attended her beginning series back in 1992 and subsequently attended the Intermediate series and several of the Advanced classes. These days, I mostly show up when the class sits down to eat: I like to think of this as giving a disinterested third-party opinion about the food; really, the food is just too good not to come eat. 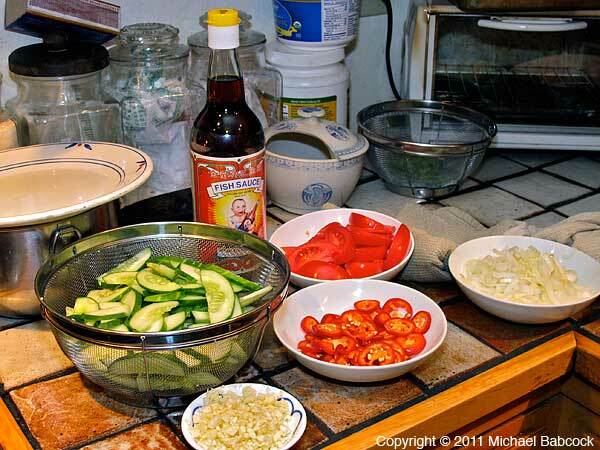 Although I can cook a number of Thai dishes reasonably well – I don’t even need the recipes for some of them – recently I decided to sit in on the beginning series again, knowing that there’s a lot for me to remember and a lot more to learn. 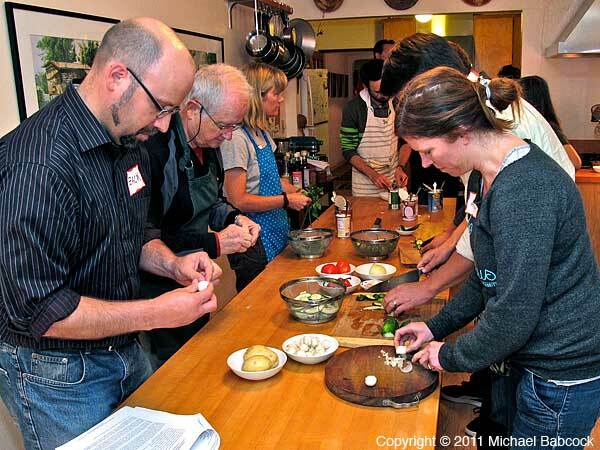 All of the classes start out with Kasma going over the recipes and introducing any new ingredients or techniques in the recipes. In the beginning series the introduction can take a bit longer because there are so many more things to introduce and go over. I had forgotten how much information Kasma gives you: we’ve had several students who have taken the beginning series more than once, for good reason! One of the best parts about Kasma’s classes are that you learn how to use ingredients that are available locally. 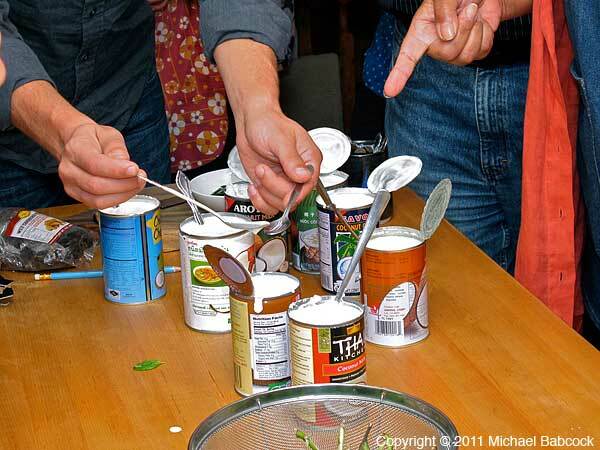 In the very first class students taste eight or nine different brands of coconut milk to get a sense for what is available and to learn which are the good brands. The correct brand of many ingredients can make a large difference in the finished taste and one of Kasma’s strengths is introducing students to the best brands that she knows. 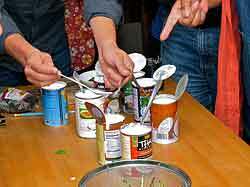 Students learn to cook authentic Thai food with the ingredient they can purchase in the United States. All classes are at least partially hands on. Students do virtually all of the food preparation – the chopping, de-shelling shrimp and so on. Kasma supervises (somehow not seeming to miss anything as the 13 students work) and steps into demonstrate as needed. 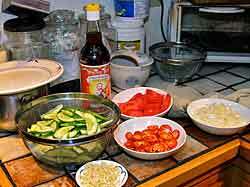 Once all of the ingredients are ready, they are gathered by the stove to be cooked. Kasma tends to do more of the cooking in the first class; as the series progresses, students do more and more of the cooking. She’ll often ask for volunteers and then supervise as the student does the actual cooking. 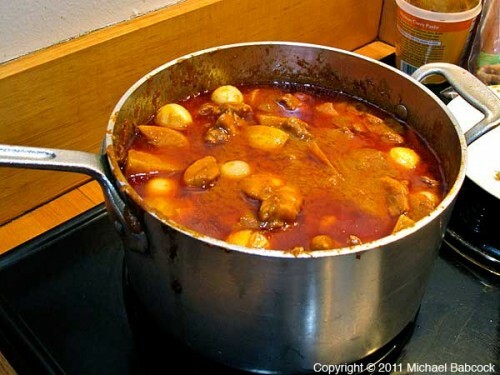 One good think about Kasma’s classes is that all the recipes are intended for groups of people, so you are cooking the dishes just as you would when you cook at home. 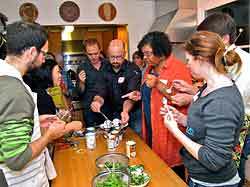 Perhaps the most valuable part of the first class is learning to harmonize flavors. (See Creating Harmony with Primary Flavors.) 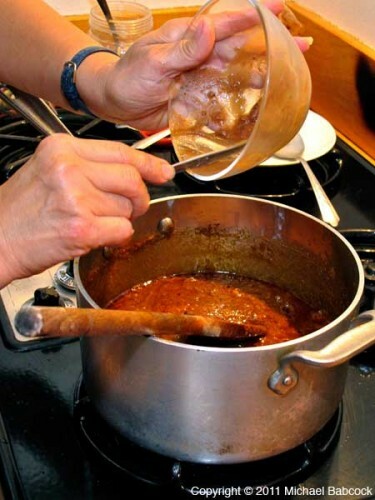 As the two curry dishes of this class are assembled, at critical points, just before ingredients such as palm sugar or fish sauce are added, students are given a taste of the dish; then the important ingredients are added incrementally, with tastes after each addition. Re-taking the class, I again felt the excitement of the alchemy of cooking, how a dish that tasted not quite right could slowly change into something absolutely fabulous. 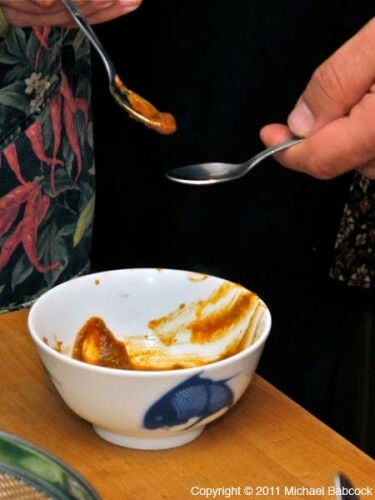 I love the “WOW” moments when you think the dish is complete and Kasma adds just another teaspoon of palm sugar (for example) and everything just POPS! into place – the dish is perfect. Of course, the best part of the class is when you sit down to eat all the food that you’ve prepared. Unlike many cooking classes, here you get a full 4 or 5 course meal complete with deliciously steamed jasmine rice. 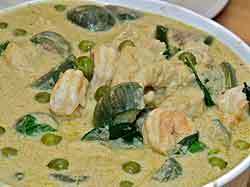 Green Curry with Fish, Shrimp and Eggplant – แกงเขียวหวาน (Kaeng Kiew Wahn) In the first series, Kasma teaches many dishes that are more familiar to people in the United States. 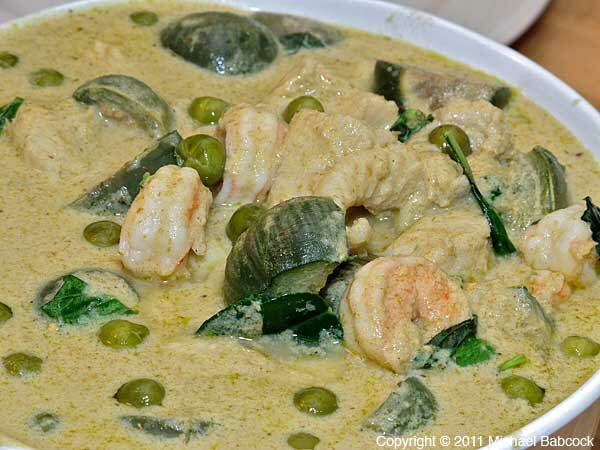 Green Curry is possibly the favorite curry of people in Thailand. I can eat Green Curry fairly often and I never get tired of it. 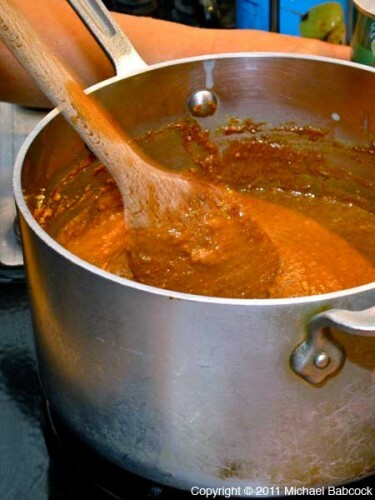 In this first class, Kasma uses a prepared paste (Mae Ploy) and shows how to balance the flavors to get a delicious result. 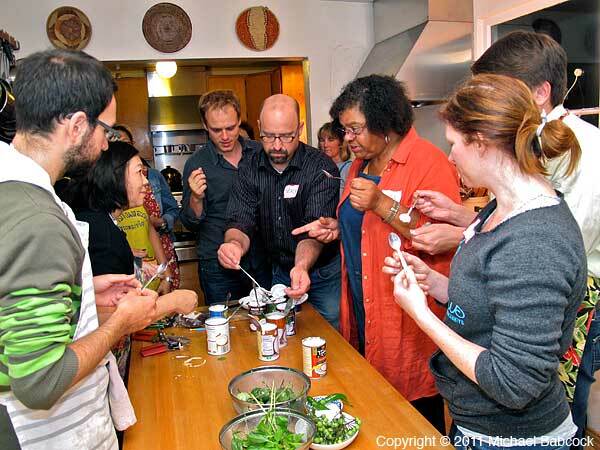 The very first time I took the class I was amazed at how delicious the dish was – it was far better than anything I’d ever had in a restaurant in this country. What struck me was how easy it was to get such a good result; I still don’t understand why the restaurants here can’t do better. 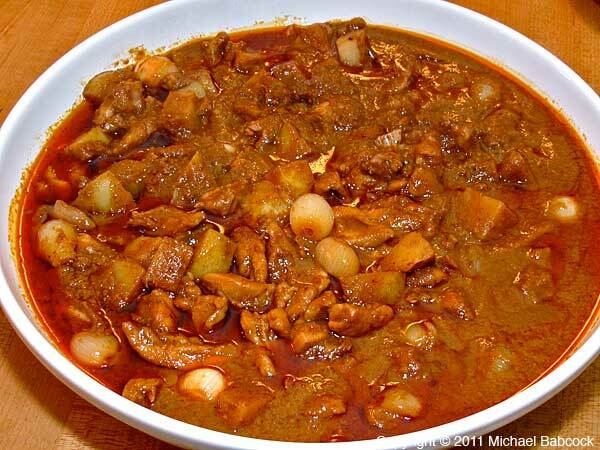 Massaman Chicken Curry with Potatoes and Baby Onions – แกงมัสมั่นไก่ (Kaeng Massaman Kai) In July of 2011, Massaman Curry was anointed by CNNGo as The World’s Most Delicious Food. It’s a very different curry than Green Curry. The word “Massaman” means Muslim so this literally is “Muslim Curry.” It’s possible that it was created at the court of King Narai to serve to Persian envoys. 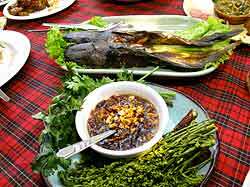 It’s made with roasted spices and almost has more of an Indian taste than a Thai taste. 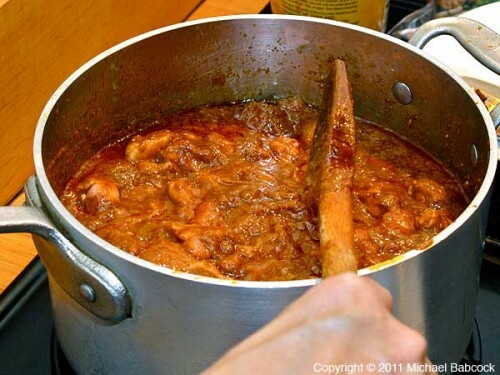 Kasma’s version uses chicken thighs and baby onions; it’s a very, rich curry – a little goes a long way. At the bottom of this page is a slideshow of Kasma cooking Massaman curry. 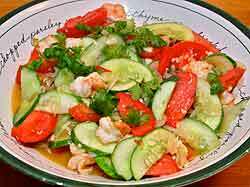 Hot and Sour Vegetable – ผัดเปรี้ยวหวาน (Pad Preow Wan)One advantage that Asian cuisine has over American would be the wide variety of vegetables and vegetable dishes. This dish uses pickling cucumbers in a stir-fry with tomatoes and shrimp. 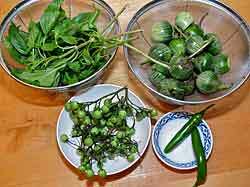 The hot comes from chillies (wax peppers in Kasma’s version) and the sour from vinegar. 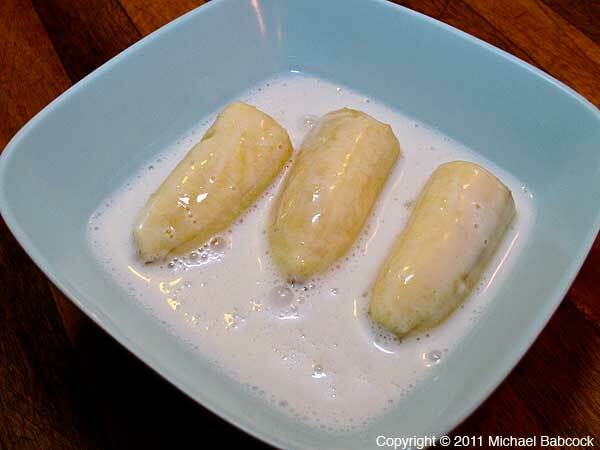 So the meaning is literally “bananas ordained as nuns.” In Thailand, nuns wear white so it’s a reference to the bananas in a coconut (white) sauce. 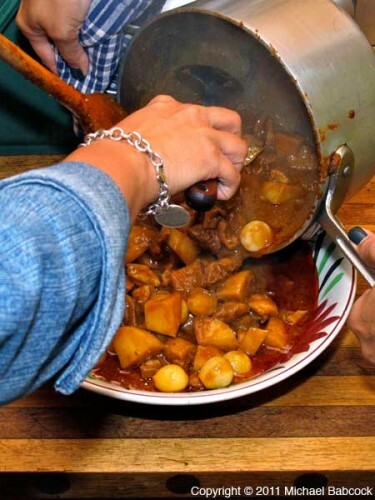 Massaman Curry in a serving dish. Yum! 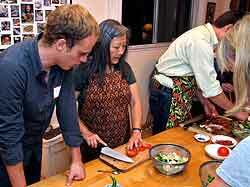 Beginning Thai Cooking with Kasma, Class #2. Beginning Thai Cooking with Kasma, Class #3. 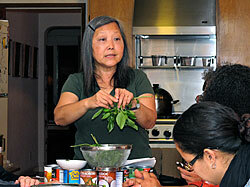 Beginning Thai Cooking with Kasma, Class #4. You are currently browsing the Thai Food and Travel Blog blog archives for July, 2012.